What’s shaking, family? Hopefully, your National Poetry Month is treating you well and you’re reading and writing some incredible things. I actually can’t believe that this is my first post of the month. In any case, things have been pretty grand on my end. I’ve banged out some stuff that I’m pretty happy about so far this month, AND I’ve been pounding the pavement and preaching the gospel to get people interested in the activities taking place on April 20th. If you weren’t aware, I’m bringing Mr. Julian Randall to town for a workshop and a reading that day, and both are absolutely, positively, 100% FREE for people to attend. I’ve been encouraging peeps to bring some money if they’re coming to the reading though. That way, they can not only take a copy of Julian’s incredible debut collection home with them, but they also can have him sign it for them. How about that? Oh! Also, I only have about 4 or 5 slots open for the workshop, so if you’d like to participate, make sure to contact me ASAP! So, Your Friendly Neighborhood Xtian is VERY happy to announce something. If you’ve been following this little website of mine for any fairly significant amount of time, you’ll know that I’ve been itching been to tell you good people about the things that I’ve been up to. Well… that time is now – at least for some things. Next month, on April 20th, I’m bringing award-winning poet Julian Randall to Chattanooga for a FREE (yes, FREE) workshop AND a featured reading! How grand is that? If you’re not familiar with Julian, here’s a bit about him: Julian Randall is a living queer Black poet from Chicago. His first book, Refuse (University of Pittsburgh Press, 2018), is the winner of the Cave Canem Poetry Prize. If you’re interested or know someone who might be in participating in the workshop, contact me ASAP. I have a limited number of open slots, and they’re filling up fast. Also, if you would like to do the Facebook thing and let us know that you’re attending, you can do so here: https://www.facebook.com/events/306484213349037/ Plus, I will absolutely love and appreciate it if you helped me get the word out. Chiming off that, this is the official launch of my new venture, which is called The Plug Poetry Project. I’ve been laying the groundwork for everything over the course of the past year, and I’m really jazzed to finally be able to let the cat out of the bag. Stay tuned for new updates (more cool stuff is coming down the pipeline SOON). Your Friendly Neighborhood Xtian is a happy man. This past weekend, I had the opportunity to support the students of GPS and McCallie again for their Amnesty Club’s Poetry for the People event. As always, it was a great time, and definitely inspiring to witness young people participating in the act of sharing poetry. How grand is that? It made me think back to when I first started reading out at 17. I was always the youngest person to show up at places, so to see a roomful of teenagers reading things that they either wrote or were by someone else is just plain amazing to me on a personal scale. In other news, I’ve been hard at work on some things that will be seeing the light very, very soon. I know I’ve been saying that for some time, but I assure you that the wait is going to be worthwhile. You will be pleased! I guarantee satisfaction, dear brothers and sisters. We’ve broken into a brand new month. March is upon us. Your Friendly Neighborhood Xtian is going to do something that he hasn’t done in… years this month. What’s that you ask? Well, I’ll tell you. This guy? He’s going on VACATION! Now, I’m terrible at having downtime, so I’m probably going to work on something while on the vacay, but still. It’s something. Also, I’ll be rolling out some cool things this month. Stay tuned! I’m extremely excited to get the news out there, and for you lovely folks to receive it. Huzzah! I’ve added yet another live date for this year. The performance is next week, and is for a great cause. If you’re in the area and interested in poetry and/or helping young people, you should consider coming out. Things have been rolling on yours truly’s end, dear brothers and sisters. Recently, I recorded my entry into this year’s Miller Audio Prize competition that’s put on by The Missouri Review. I’ve submitted for it a number of times over the years, and I figured I’d do something a bit different this go round. For those of you that don’t know, I started producing music in 2002 and have made a pretty solid range of music that’s run the spectrum stylistically for others and myself since then. I thought that it would be a good idea to not only showcase what I can do musically to enhance the text, but to also do something that provides a narrative. I’m really satisfied with how it turned out, and at some point this fine year, the results will come in. Keep your fingers crossed for me! That aside, I took part in a program just last night about activism. I really enjoyed hearing from different members of the activism community in town and how we advocate for each other and the causes we’re passionate about. I didn’t have much time with my small group, but what I tried to impart to them was that activism really boils down to figuring out what moves you, deciding what you want to do/can do, and committing from there. Those tend to be the core steps to the dance, in my most humble of opinions. Greetings! Welcome to February. Black History Month, the month of love and overpriced trinkets to show someone that you care about them, etc. All the things! Twenty years ago this month, I went to the Bahamas on a high school trip, almost got stranded there, and, the night I returned home, watched Event Horizon (which is a classic, by the way) for the first time. Ah, memories. Anyway, hopefully the beginning of this year has been grand for you and yours. It certainly hasn’t been too shabby for yours truly. As usual, I’ve been hard at work on a number of things, and I am immensely excited to tackle each and every single one of them (how often can anyone say that?). I’ve been pushing the pen and computer keys to bang out another full-length manuscript and working on some cool (in my most humble of opinions) programs for my neck of the woods and myself. Plus, you know, all the other things. If you’re reading this, CONGRATS! You (yes, YOU) SURVIVED 2018! And now we’re here, living at the dawn of another year. I think 2019 is going to be an interesting year (really though, what year isn’t? ), and, for me, one of growth. I have some AMAZING things lined up that are going to be coming to fruition this year, and I’m extremely excited to unveil them all to you when the time is right (which shouldn’t be too long down the line). I hope that you fine folks stay tuned. You’ll approve of what I’ve been cooking up in the kitchen. Greetings, family. We’re at the time of the year where driving is typically atrocious, and people pretend to be kinder creatures than they really are. Also, it’s the time of year where other things tend to wind down. That’s not exactly the case for me, but it is true in certain aspects. One such arena where that holds true is on the performance front. I had my last public showing on a stage this past weekend, and it was a really good time. I had the chance to rock out for my friend Butch Ross’ Xmas Extravaganza show, and it was a bit surreal. I shared the bill with a number of people I came to know in 2009 when I embarked on my Forced Exposure Tour. Over the years, life has taken us in a number of directions. This weekend was my first time seeing some of those people in years, and the whole thing was a reminder of not only how much I’ve missed some of their company, but also of how immensely talented the cast of performers truly are. What an absolute honor. You know, I made the decision for the past two years to take a step back from hitting as many stages as I’ve averaged since 2009 to focus on some other things. You know, diversifying the palette, so to speak. I’ve put a good amount of energy into creating programs, pursuing different projects, and writing and submitting things for publication. As we’re staring at the end of 2018, I’m really proud of all the poems that found homes outside of mine this year, and those that have already been accepted for publication in 2019. One of my goals for some time now has been to have at least one book out into the world, and I’ve been putting in the work to make that a reality. I legitimately feel like I’m on the right path and that that will happen before too terribly long. This guy? On the optimistic side of the coin. What’s good, family? Hopefully, you’re all fighting off colds successfully, sufficiently bundled-up if need be, and not battling your fellow man out in these streets for toys and deals and such. We’re officially six days into the last month of 2018. I’m not sure if any of you can relate to this, but I feel like a lot has happened this year (both personally and beyond), and, at the same time, that it hasn’t. Gotta love paradox. Chiming off that, I updated my Media page. You can now easily find a good number of my published works as well as some other new things. Check it out! In other news, I had the chance to participate in the GPS Amnesty night poetry reading. I believe I’ve participated in all of them, actually, so the fact that the streak continues feels great. It was a wonderful time, and it made me feel really proud to hear the kids reading poems from some of my favorites, such as Ada Limon. Also, this past Saturday, I ended up caching a last minute performance for this year’s Mainx24, which is a 24-hour festival. This was the first year in a while where I didn’t do my Speakeasy Revue, and it felt good to just be able to rock out, be appreciated, not have to worry about lugging equipment around (in the rain, no less), etc. Honestly though, I’ve been thinking a good bit about last year’s Mainx24 where my poetry students and I had to endure a man going crazy during our scheduled performance, and it made me feel angry all over again. I wasn’t just angry that that happened, but that people I’d considered good acquaintances and partners defended his insanity (he pushed a spectator, threatened to throw a stink bomb and clear our event out, and go in my face, cursed me out and put his hands on me), but accused me of “spreading hate” online by telling the truth about what happened on social media. I recently told a good friend of mine that we’re living in an era now where you can easily find encouragement to tell and live your own truth unless that truth happens to be about someone or something else that people close to you like. Then, they want you to swallow it or fill your mouth with silence. Who has time for that? If that’s the way people genuinely feel and want/expect you to operate, they’re not your people, advocates, fans, friends, etc., and, really, they probably never were nor will ever be. We’re almost midway through November. Already! Time – she flies! Things have been pretty solid on my end, and I sincerely hope that you can say the same on yours. Allow me to jump into what’s been going down with Your Friendly Neighborhood Xtian. First, the good people at Welter have accepted one of my poems for publication in their next issue. If memory serves, I wrote the particular piece that they’ve taken in November of last year, and it not only features an epigraph from a Mobb Deep song, but also boasts a cameo from someone who used to work at my favorite bar. Beyond that though, what’s especially wild to me is that this piece and a number of others that were written for my latest chapbook manuscript have been finding homes. The poems are really heavy animals and deal with race, and the fact that people are willing to allow them to live in other spaces given the fact that race is something we often don’t really talk about, but talk around, feels amazing. Chiming off of that, you should check out my BRAND NEW BLOG (it’s been some time since I’ve been able to say that). In it, I talk about something that happened last week that deals with race, culture, and our understanding (and lack thereof) when it comes to the two. Switching gears, I believe I let the cat out of the bag a few months back. If so, then consider this old hat. However, if I didn’t, then you can consider this to be NEWS! I was awarded a grant to do a project by the fine folks at Artsbuild, and I’ve spent the bulk of this year working on a documentary. I’m very happy to say that we’re close to getting things where they need to be. I’m currently combing through footage, and since we’re going to release everything episodically, we should have, at least, an episode or two ready to go before the big ball drops and closes out 2018. Stay tuned! I can’t begin to tell you how excited I am for you to see and experience everything. This has been a tremendous learning opportunity and has taught me a lot about myself as well as my capacity for patience, accountability, communication, etc. Greetings, ladies and gents. It’s fitting that I’m writing on Halloween. Mua ha ha!!! I always feel a little bit bummed after Halloween passes. The fun vibe for the rest of the year kinda disappears, but it is what it is. That bit of confession aside, things are pretty solid on my end of the coin. I wrapped up this fall’s Meacham workshop, and for the second consecutive year, it was great fun. Not only did I have a good time having the chance to get to know and talk shop with other writers and students, but I had the chance to try out something new teaching-wise and soak up SO MUCH inspiration. Also, randomly, I passed by Terrell Owens on the last day and he said “Hey” to me. How about that? Hola, family. As I write this, Hurricane Michael is in full effect, so I sincerely hope that everybody is safe and sound. One of my newest poems was published this week by Vagabond City for their latest issue. It’s certainly interesting to have this particular one out in the world. I believe I’ve mentioned it on here before, but I’ve been working on a series of poems that actively addresses depression, trauma, etc. in a way that I haven’t before. If you’re so inclined, you can peep the poems here https://vagabondcitylit.com/2018/10/10/gaslight-by-christian-j-collier/ and if you do decide to check it out, I encourage you to also peep the other works, too. Switching gears, I’m really excited for the next few weeks. We’re going to be completing phase one of an incredible project, and beginning stage 2, so I’m definitely looking forward to the transition. Huzzah! Greetings Ladies & Gents. It feels great to be broadcasting from the beginning of my favorite month out of the whole year. There’s just something about October. What can I say? Birthdays, changing leaves, Halloween, never-ending pasta. Ah, man. Breathe it in! Things have been rolling on my end. After having a piece accepted by Apogee Journal, I decided to revisit the manuscript that it came from. I tore pretty much everything apart, and then rewrote most of the pieces from the top down. I think the whole thing works WAY better now, and as a result, I’ve been shipping it out for consideration anew. We shall see what everyone else thinks. Maybe, just mmmmmaybe, that bad boy will find a home independent of my hard drive. Chiming off that, I JUST had a piece accepted by the good people at Vagabond City Poetry. If I’m not mistaken, the issue it appears in will be popping up this week. As always, I will keep you guys posted. I’ve been grinding to finish a special project, too. Things look good right now, so if everything bodes well, phase 1 will be knocked out right before my birthday. Dun, dun, dunnnn. Also, I’m really looking forward to being back in the fold for the Meacham workshop later this month. I had an absolute blast last year and feel honored to be invited back. If you’re free on the 26th, I’ll be reading around noon at UTC. I updated the venue location, so if you were wondering where the festivities would be taking place, I’ve got you covered, son. Stay tuned for more deets! Lastly, I was reminded earlier in the week that it has officially been five years since I received the physical copies of my debut EP Between Beauty & Bedlam. Making and releasing that project into the world was truly a special feat for me. With that said (and I realize that the world has largely begun actively moving away from CDs), from now until the end of 2018, if you’d like the digital version of the record, you can get it from me for $5. All you have to do is hit me up via the Contact Me form on here, and I’ll walk you through the steps of the dance. Easy! In addition to that, the schedule for Meacham is up now. I’ll be reading the day after my birthday, so that’s pretty sweet. You can find the schedule at: https://www.meachamwriters.org/schedule.htm I’ll be at everything, so I hope to some of your beautiful faces in attendance as well. Brothers and sisters, I hope everyone who is in the path or close enough to be impacted by the hurricanes is taking every precaution and doing all that they can to be safe. Hurricanes are no joke. I used to live in Florida, and it was common to see people operate with a very whimsical outlook when it came to them, but when you think of the devastation caused by Andrew, Sandy, Katrina, Maria, and more, prioritizing safety shouldn’t even be up for debate. Those are my two cents because I care, and with that, I am now officially off my soapbox. Moving on to other biz, Your Friendly Neighborhood Christian recently had a piece accepted by Apogee Journal. I’m pretty thrilled about that. Apogee has been on my list of places where I’d love to see my work appear, and now that appears to be coming to fruition. I’ll keep you fine folks posted on when you can get your eyes on the work. I’ve been reading a good bit lately, which is something that I don’t find myself getting to do as much as I once did, but I’ve definitely enjoyed my return. If you’re a poetry lover and reader (hopefully, both are true for you! ), I would recommend both books by Jericho Brown as well as “Black Aperture” by Matt Rasmussen. Amazing things await you if you so choose to take my suggestions (and why wouldn’t you?). Well, that’s it for yours truly right now. Be good, stay dry, and definitely don’t be strangers! Your Friendly Neighborhood Xtian recently visited the Left Coast and explored Los Angeles. It was a really beautiful excursion. While there, I had the opportunity to check out one of the branches of MOCA, and a number of the works are, a week later, talking to me. It’s one of my absolute favorite things in the world to encounter a piece of art, be it an album, a collection of photographs, a dancer’s performance, etc. and not only be awed by it, but have it continue to have its way with you. Ah! I’m really looking forward to truly witnessing how those works change me, because I am of the belief that everything we experience does. In other news, I’ve received some really cool information. First, one of my students, Brynija, who participated in the first two years of my MANIFEST Voices program, recently competed in her second year of the Poetry vs. Hip-Hop show. Friends, I cannot express to you how elated I am to report that none only did she win her bout last year, but she did the same dang thing THIS YEAR! Not only that, I think she gave her best performance that I’ve seen to date. This guy? Uber proud. Chiming off that, I’ve been working on a few things that have really been speaking to my spirit. One of which is a series of poems that I feel like I kind of stumbled into writing. They’re dealing with healing, trauma, therapy, depression, etc., and, as a result of penning these things, they’ve sparked me to have some pretty interesting conversations with people and tell more of my truth. I think the latter was definitely one of the things I sought to do at the beginning of the year, so it feels both nice and fated that this would be where I was at only a matter of months later. Well, that’s about it for moi for now. Be good, find something that sets your soul aglow, document it (because that’s the thing to do these days), and don’t be strangers! I’ll be back in touch before too long. I promise. You probably have noticed by now, but it’s August. AUGUST! Your Friendly Neighborhood Xtian has been an extremely busy man, but he’s also immensely grateful and happy, too (and a little under the weather at the moment). Let’s jump into things! My poetry students absolutely DID THEIR THING at their showcase. I could not have been prouder of them. They all stepped up to the plate, quelled their nerves, exhibited great poise, and owned the stage. I felt like a proud dad watching it all go down. It’s crazy for me to think that not only was this the end of my third straight year of teaching the workshop, but that the idea for it came to me in an Uber in Boston. What an absolute blessing this experience has been, brothers and sisters. While we’re on the topic of blessings, I performed a few pieces last Sunday for Christ Unity’s service. This was my third time doing poems for their service (as fate would have it, it’s always in the month of August, too), and as always, it was a treat for me. I read “Good Bones” by Maggie Smith and my poem An Invocation. I felt both were pretty relevant given the world we live in these days. That’s about it for me right now. I hope all is well on your ends. Be good, stay hydrated, and I’ll be back in touch before too long. PEACE!!! Your Friendly Neighborhood Xtian is riding a good wave, and I hope you can say the same. Last week was a busy one, but it was the good kind of busy and yielded some amazing results. Things culminated with my Pecha Kucha presentation last Friday. I talked about my journey in trying to help others discover and cultivate their own voices and bring some of their own dreams to fruition. I think it went well. In other news, I had my penultimate workshop session with my MANIFEST Voices students yesterday. They’re getting there! By the 28th, they’ll be poetry machines ready to poem your faces off and make you like it. How’s that for a hook? Seriously though, I’m very proud of them and the work they’ve put in thus far. I’m also immensely happy to have them as a part of my growing MANIFEST family. That’s about all I’ve got for now, brothers and sisters. Be good, stay cool, read and enjoy Jericho Brown (really, how could you not do the latter? ), and I’ll be in touch before too long. Poet’s honor. What’s good, family? Hopefully, you’re not melting from the apparent heat wave that has taken over the country or been washed away by the numerous hard rains that have rocked certain parts of the country. If you have met your demise from either one of those, you have my condolences. Anyway, A LOT has been transpiring on my end, and I’m extremely jazzed to tell you about it. Let’s jump in! First, Your Friendly Neighborhood Xtian is rapidly reaching the finish line with this year’s MANIFEST Voices students. The kids are great, and I’m whipping them into shape for their showcase, which will be on July 28th at The Arts Building. It’s absolutely FREE (promosexuals, rejoice!) and if you’re reading this, consider yourself invited to attend. I’ve said from the first year of the program that it means so much more to the kids (even if they don’t immediately recognize or appreciate it) when people who don’t know them or owe them anything show up to show their support and that what they’re doing matters. So, if you’d like to make a difference in the lives of seven incredibly talented teens, come on out around 5:30. Seats are limited! Next, THIS FRIDAY, I’ll be a speaker for the latest Pecha Kucha in Chattanooga. Things get underway at 6, and I also believe that it is free (once again, promosexuals, get your rejoice on!). There’ll be 8-12 speakers for the evening (each of our talks is a max of 6 minutes and change), and I’m excited to see how things go. It’s been a while since I’ve attended a Pecha Kucha, and this will actually be my first one as a presenter, so I’m looking forward to it. In other news, I’m hard at work on a project that has challenged me across the board. It’s frustrated me, forced me to consider and learn new things, forced me to grow and visualize a larger picture, etc. It feels good, and I’m extremely fortunate to be working with someone now who has vision, initiative, and a desire to help make this thing the success I feel it can be. If all goes according to plan, you’ll be able to check out some really amazing things before too long, so definitely, definitely, definitely stay tuned! So, we’re a few days away from the summer of 2018 officially being upon us. If where you live is anywhere similar to where I live, it certainly has felt like summer for some time now. In any case, I have all kinds of things happening right now that I’m extremely excited about. Like a pool in the summer (see what I did there? ), let’s jump in. This Saturday, I’ll be a host for the Chattanooga Readers and Writers Fair. I believe festivities run from 10-4:30, so if you’re in the neighborhood or plan to be, make sure to swing by the downtown library and hang out with us. I’ll actually be hosting the last portion of the day, and I’ll have my merch on hand, so if you’d like to take home a little bit of Your Friendly Neighborhood Xtian, you can do so! In other news, I’ve been working with my students for this year’s MANIFEST Voices program, and things are going pretty well, I must say. The kids are sweet, so in a few more weeks, they should be finely-tuned poetry animals ready to rock out in front of the community. Dun, dun, dunnnn. No pressure. If you’re reading this, consider yourself officially invited to check them out, too. You can find the deets in my Performances section. Lastly, as some of you know, I’ve been working on a documentary. I’d been reluctant to put that info out because it seemed like things weren’t going well, but there’ve been some significant shifts recently that have renewed my excitement about the project and my commitment to bringing it to fruition. I’m really psyched to announce everything that I have lined up, and you (yes, YOU) are needed to make this thing what I REALLY want it to be, which is a platform for the city’s voice as well as the voice of its people – regardless of background, education, etc. Stay tuned!!! So, today is May 25th, which is a pretty special day for yours truly. Why? Well, you’re in luck, because I’m going to tell you! This guy? A giver. On this date seventeen years ago, I performed a poem for the very first time. It was pretty much a wrap from there. I’d been writing for years up to that point, but I really consider reciting on a microphone that first time in 2001 as the moment I turned a corner and really felt connected to an artistic community. If you’ve followed this website or known me for the past however many years, you probably know that I’ve come to view and refer to May 25th as my second birthday. With that in mind, I figured it would be fitting to make an announcement on something I’ve been working on (and will be working on) for the remainder of this year and beyond. I’m in the process of making a documentary, which is personally exciting and challenging simultaneously. This project received support through ArtsBuild’s Equity in the Arts grant program, and it’s a new undertaking for me. I have learned and continue to learn quite a bit, and I’m pretty jazzed to share the goings on along the journey as well as the finished product with you. So, today is my official launch day. What you can expect in the comings weeks is new social media accounts that’ll house the content as well as some other nifty things I have in store for you, merchandise, and an invitation to be a part of this. I’ll elaborate on how in the near future as well, but please know that, continuing with what has been somewhat of a mission the past nine years of providing a platform for the voices in the city, this will be yet another means to do that. In other news, applications for this year’s MANIFEST Voices are due THIS MONDAY! I’m really looking forward to digging in and working with a new group of young poets. It’s amazing to me that this is the third year of my program, and the fourth consecutive year I’ve spent my summer teaching. Before Voices got off the ground, the pilot was a part of a package called Ladders for Leaders. Time flies, dear brothers and sisters. How goes it, family? Hopefully, things are going well for each and every single one of you, and you’re not roasting under the weight of the sun wherever you happen to find yourself. Things have been going well on my end. My schedule has been on the packed side the past however many weeks, but that’s the way I prefer things to be. In my line of biz, something is usually wrong when there’s an abundance of stillness and quiet. In other news, I’ve been carving out some time to shoot out submissions. Honestly, I don’t often make enough time to submit as many things as I should, so I’m trying to right the ship on that front. Keep your fingers crossed that some of these things find homes. Lastly, I plan to make an announcement on the 25th of this month. I’m REALLY excited to do it, and I hope that you and yours will be geeked, too. May 25th is a special day for me because it’s when I touched a stage for the first time, so I thought it would be fitting to tell you guys about something special that I’ve been (and will be) working on. Stay tuned! So, National Poetry Month is officially in the books for 2018. I managed to knock out 30 poems for the 30/30 challenge again this year, which is great because prior to undertaking it, I’d only written one piece this year. It feels good to have in the pile, and I’m actually pretty pleased with how a number of the pieces shook out. In addition to that, I have some other really cool things in the works for this month. I’m excited to tell you all about it when I can. Just know that I’m involved in some unique things, and, eventually, you can (and I hope you decide to do so) get involved in them, too. Huzzah! April is rapidly approaching its end for 2018. This month has been pretty packed, but in a good way. This time last week, I was gearing up to head to Tampa for a reading and some other things at The University of Tampa. Twice, Your Friendly Neighborhood Xtian dealt with some pretty good delays. As a matter of fact, on the way back from Tampa, my first flight got delayed… FIVE TIMES. No jive. I’ve never experienced that before. I’ve been putting in work on the 30/30 challenge on Instagram. The process and reception has been interesting this year. It’s been a different bag of chips from last year’s go at it, which is good. It keeps me on my toes, and since I try to operate sans expectation, it’s another learning opportunity. If you haven’t been checking it out (shame on you! j/k), for this year’s foray, all of the poems are centered around song titles. It’s definitely been a good exercise and has put my creativity to test in ways that it probably hasn’t been since October of last year. That’s when I finished the manuscript for my chapbook. I really haven’t written much since. I have a NEW blog up, and I have a new addition to my Performances section. Ch-ch-check me out! Your Friendly Neighborhood Xtian has been GRINDING this month. Well, this month and last month. Probably the month before that, too, but who’s keeping track? So far this week, I had the pleasure of presenting the grad 6-12 winning poems and prose piece for this year’s Young Southern Student Writers Award Ceremony. 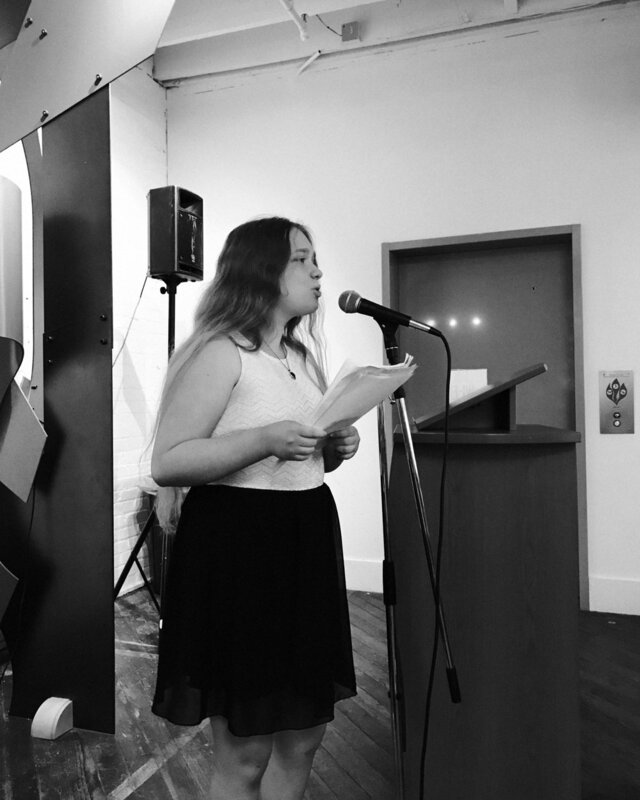 As fate would have it, Ruth Beeland, who just so happens to be one of last year’s MANIFEST Voices students, took home first place in the poetry category. I was very pleased, because I had absolutely nada to do with the selection process. She earned it on her own merit, which makes it even sweeter. In addition to that, I did a little lesson for the Chattanooga Writers Guild last night, and it turned out to be big fun. Was very pleased with the response, and I feel like we managed to sufficiently cover a good deal in a little more than an hour. Now, my sights are on Tampa! Dun, dun, dunnnn. I’ll be making my way back for the first time in almost a decade. How about that? Not only do I get to return to my old stomping grounds, but I get the opportunity to talk a bit and read with a few other alumni. I’m really looking forward to it. If you follow me on Instagram, you can expect some South Florida pictures to be popping up next week! The suspense!!! Speaking of Instagram, I’ve been working my way through this year’s 30/30 poetry challenge on there. I’ve been using pop songs in a number of genres to riff on, and I think it’s ben shaking out pretty well, honestly. Today’s piece, for example, was inspired by Canada’s own Drake. I have no idea what tomorrow holds, but I’m definitely looking forward to the pursuit. It’s like a DJ digging for records. Each day, not only is the goal to write something, but, at least for this guy, to discover something and reinterpret it in a fresh and interesting way. If you haven’t already done so and would like to, you should check it (and me) out on the IG. Say hello! It is National Poetry Month. Huzzah! Your Friendly Neighborhood Xtian is tackling the 30/30 challenge again this year. If you were around these parts last year, you quite possibly know that for 2017’s undertaking, I decided to use Instagram as a platform for the pieces. That exercise proved really beneficial in a number of ways. Not only did I manage to bang out some poems that I was and still am pretty proud of, but I also had the opportunity to have one of my favorite artists EVER respond glowingly to a piece I wrote about her. I, literally, shed a few tears at that. This time around the track, I don’t know what to expect, which isn’t much different than how I felt at this time last year. Really, in general, I try to operate sans expectation. I feel like assigning expectations is a pretty fast way to kill any adventure that this crazy thing called life throws at us. So, we’ll just have to see what happens over the course of this month. Dun, dun, dunnnn. Oh! And if you’re interested in seeing how things are shaping up thus far, feel free to follow me on Instagram. You can do so by simply clicking the IG logo here. In other news, my dance card is starting to fill up, which feels great. This Friday, I’ll be lending my voice to the poetic chorus of GPS and McCallie’s Poetry for the people event. It’s always interesting to take part in an event that consists predominantly of teens. It’s an honor and a wonderful learning opportunity, too. Next week, I’ll be leading a workshop for the Chattanooga Writer’s Guild. Deets are up in my Performances section. It’ll be a good time. You should come through if you’re able to do so. March Madness is officially winding down (both in the sportsworld and in general). My March has been on the packed side, but I’m not complaining. April is going to be great, and I happen to have myself an announcement to make. Stay tuned! Also, as I’m sure you fine folks know, April is National Poetry Month, so I’m going to be giving the 30/30 challenge another go and throwing the results up on Instagram. If you’re not already doing so and would like to follow me to see what’s what, you can do so by clicking the IG logo that’s here on my site. That aside, beloveds, I’m excited to announce that I’ll be a host for the upcoming Readers and Writers Fair. Word on the street is that they’ll let me do a few poems, too. If you’re a lover of literacy or are the parent/guardian/close friend/bad influence to someone who is, you should either be there or encourage someone to do so. I happen to think that it’ll be a pretty grand occasion. Lastly, we’re gearing up for year three of my MANIFEST Voices program. It’s wild to think that this will be the third time around the track. We have some cool additions this go round, too. Make sure to stay tuned for the details. Well, that’s about it for me. Keep your heads up, and keep those springtime allergens out of your nostrils, boys and girls. I know the site has been pretty quiet for 2018. I promise you that I haven’t gone MIA. Honestly, I’ve been working on something (really, a number of things, to be perfectly honest) that I’m REALLY excited about. If all bodes well, I’ll be making an announcement within the next few weeks. What can you expect??? Cool things that you’ll, hopefully, engage with. I feel like so much of art, or, specifically, art in Chattanooga, exists in a vacuum, which, to a certain degree is fine. However, I’ve always been interested in making things that aren’t just confined to one demographic, and it would make me a pretty proud person to have you and yours not just support what I’m going to be undertaking, but to be involved each step of the way. Just sayin’. Be on the lookout, brothers and sisters. Good things are COMING!!! So, 2018 has been an interesting year for Your Friendly Neighborhood Christian. I‘ve been on the sick side of things on and off since right before the New Year, so I’ve been pretty conservative in regard to my time and energy. As a result, I’ve neglected a few things – this website being a chief one. With that said though, I feel pretty solid now, so let’s jump into what’s going down! What do you say??? Also, a few days ago, the equally good people at Breakwater Review accepted my poem Derailment from my manuscript. I’ll keep you guys in the loop on when and where you can check that out, too. In addition to publishing, things have been pretty good elsewhere. I performed at an event called Woke that was put on by Jazzanooga and artist/all around solid guy Josiah Goldson. It was a really good time. Also, a few days after that, I DJed the MLK Day of Service for The City of Chattanooga. It was my second consecutive time doing so, and that was big, sweaty fun. I’d really like to do more DJing this year, so don’t be surprised if you see me out and about with headphones adorning my head cranking out the dope jawns. What’s shakin’, family? Your Friendly Neighborhood Xtian has NEWS! Earlier this week, I was awarded a grant. Woo! My proposal was to make a documentary series, so that’s going to happen! It’s an opportunity to do some cool things, develop new creative skills, and showcase some really incredible people. Please, please, please stay in the loop, because my partner (the ever-amazing Megan Hollenbeck) and I not only want, but NEED you (yes, YOU!) to be involved in the process of bringing our project to fruition. Switching gears, I had my last gigs of 2017 (unless something falls into my lap in the near future) last weekend and earlier this week, and I have to say that they were wonderful gifts for me. Great energy, great ambience, attentive crowds, etc. After my last blog and the things I’ve been thinking about in terms of the power and validity in speaking out, I realize (I feel like I forget and then realize this every six or so months) that there’s also a lot of power in actually being heard and received. What a seemingly simple honor. Kind of chiming off that point, 2017 has been an excellent year in terms of communication. I mean, I’ve felt for years that social media often is like shouting into a large, dark vacuous abyss, but I was able to truly connect and converse with a number of people I, honestly, thought I’d have no chance to dialogue with… and social media was the medium that made it possible. A large part of this communication was Instagram. I’ve decided that, as a result of this, I’m going to post some of my favorite poems that I banged out for this year’s 30/30 challenge on Facebook and Twitter (you had to follow me on IG to read them previously). Well kids, that’s about it for moi. Be good, stay warm, don’t fight anybody while navigating anywhere selling anything remotely Xmas-like, and I’ll be in touch before too long. So, this past weekend wrapped up yet another adventurous year at Mainx24. For my Speakeasy Revue, the students from both years of my MANIFEST Voices program and I held down the bill. They all absolutely crushed it. What’s more they did so in lieu of some… very odd circumstances. A man threatened to throw stink bombs to clear out our event among other things, and in spite of that, they kept their composure and did their thing. In the workshop I teach, dealing with things like that is actually something we cover, so it made me even more proud that they were able to keep their wits about them and deliver. My young pros! I’ve been processing what transpired during the span of that performance quite a bit, and, honestly, beyond feeling angry, I feel disappointed, hurt, insulted, and puzzled by some of the responses I’ve received. I decided to write a blog about it all in an attempt to unpack it – mainly for myself, and even the fact that I feel it necessary to say that bit is a part of the problem. On a different note, later, when night fell, I was talking with some friends, when, in a surreal moment, I turned my head and saw a girl get hit by a car. We raced into action to lend our assistance. Then, after the girl was stabilized and transported to the hospital… some of us ate dinner. For years, I’ve said that Mx24 is always an adventure, and this year definitely didn’t disappoint. What’s the haps, brothers and sisters? If you’re living in or around Chattanooga, hopefully you’re as psyched about Mainx24, which goes down THIS Saturday, as I am. I’m not a very outwardly excitable person, so it definitely says something when I proclaim that I’m very much looking forward to something. Furthermore, I’m excited for good reason. This year, for my Speakeasy Revue (which takes place from 1-2 right by Star Line Books), my poetry kids are going to be carrying most of the load. I’m already anticipating feeling like a proud dad yet again. In other news, I’ve been hard at work on a chapbook manuscript (this is different from the other manuscript that I’ve mentioned on here). I think there’s a lot of really strong material in it. It’s about race, and while banging out some pieces last week, a thought occurred to me. As a result, I have a BRAND NEW BLOG about it!!! You should check it out, if you’re so inclined. Aside from that, I’ve got a few new gigs posted in the Performances section. You should come see me! Somewhere! Sometime soon! You know you wanna! So, I’ve been in a fairly (for me at least) interesting place in my life. I’m not sure if it’s the byproduct of being older, or simply realizing worth and what I need, but I’ve been erecting walls as of late. For those who know me (like, REALLY know me), you know how open I am. I pride myself on it. After shows, I’ll talk genuinely and at length with anyone who wants to. I make myself uber available for my poetry students. Long story short, I invest my energy in a lot of people and things, and I often provide access to my body, skill set, network, etc. Recently, I decided that it’s okay to shut things down as far as that goes in order to preserve self, the aforementioned energy, and, honestly, sanity. I happen to be a big believer in signs, so last week, I stumbled across something that Roy Guzman (who is an incredible poet, if you weren’t aware. You should check his stuff out ASAP) said on Twitter. Basically, he stated that it’s perfectly fine to keep whatever you need to to yourself in order for you to remain healthy. Serendipity??? Perhaps. All I really know is that it has felt pretty good to say no to things, to be extremely selective in who and where I choose to bring my energy, and to reward relationships that have been extremely one-sided with distance and silence. Who knew? And I’ve been able to do all of this without any hint of shame or guilt, because I know that this is what I require right now. I’m focusing on doing my work, tending to my life outside of the work (which is something a lot of people who know me have probably never heard me say before), and it all has been what the doctor ordered… without the expensive costs on the back end. So, my debut EP Between Beauty & Bedlam is officially FOUR! On this very day, it came out in 2013, and it’s been so wild to think back on how much my life has changed since that span of time. I’m sure most of you who are reading these words haven’t heard it, so I’ll forgo trying to coerce you to do so, but I will say that making that particular project meant a tremendous amount for me. In other news, I’m getting squared away for the Speakeasy Revue performance for Mainx24. This will be our third year rocking out with the good people from Star Line Books, and I’m STOKED (yes, I broke out that ol’ skater vernacular. Don’t hate) to be able to use that space to further showcase some of my MANIFEST Voices students aka my poetry kids, as I lovingly refer to them. You should come on out and poetically get your face melted. I mean, it’s probably going to be cold that day, so a little face-melting can be just what the doctor ordered. We’ve got one more month in 2017! How crazy is that? I remember distinctly how this time of year in 2016 felt, and I’m thinking about writing a blog about that very time. So much changed then, and has changed ever since. Your Friendly Neighborhood Xtian has been BUSY! Now, I’ve been the good kind of busy, but it’s also the draining kind of busy, too. Funny how those two things can occupy the same space, eh? If you’ve been keeping up around these parts, you know that I recently finished a manuscript. I’ve been shooting it out to some places for prize and publication consideration. Also, I’ve been working on a chapbook for Button Poetry’s competition, gearing up for the THIRD YEAR of my Speakeasy Revue performance for the Mainx24 festival in Chattanooga, AND grinding on an amazing project that I’m seeking funding for. All things considered though, I’m immensely happy. It just would be a little nice to take a few days off to just do nada and recharge. Ah, well. We sleep when we die, right? Well, dear family, it is officially Devil’s Night! What exactly does that mean? Hmmm. It means that, aside from re-watching (or watching if you’re a member of the generation that has recently come of age) “The Crow”, it is also the day and night before Halloween. There you have it! You’re welcome. Boy, what can I say about last week? It was AMAZING. I turned another year older (and mmmmaybe wiser), and I had the distinct honor of taking part in the Meacham Writers Workshop. This was my first one, and I had an absolute blast. I got to talk shop with a wonderful array of writers, share a stage, lead a seminar, etc. It was a truly beautiful experience and made me happy to belong to such an incredible fraternity. Huzzah, writers! Oh! And if you would like to check out my reading from last Friday, you can do so here: http://www.meachamwriters.org/writers/christian-collier.htm HUGE thanks to Mr. Bill Stifler for not only recording the performance, but for getting it up and available SUPER FAST. That man stays on top of things. That’s all I’ve got for now, gang. Be good, stay warm, have fun grubbing on candy regardless if you trick or treat, and I’ll be back in touch before too long. Dear brothers & sisters, today just so happens to be your Friendly Neighborhood Christian’s BIRTHDAY! It’s interesting. I suppose the older you get, the less you really FEEL older, or care about your own birthdays. This one is a bit different though. Since last year’s birthday, quite a bit has shifted in and around my life. It also feels like it’s gone by so astronomically FAST! I can remember last year’s birthday in vivid detail. Your Friendly Neighborhood Christian performed at Dalton St. last night, and it was BIG FUN! I’d never set foot on campus before, so it was interesting to take in a little bit of the school (a VERY little bit) before doing the do. The turnout was solid, only two people fell asleep, and I think most peeps had a good time. I certainly did. It’s rare that I do full sets locally now (which I always prefer to do), so this was a bit of a treat for me. Next up on the ol’ agenda is the Meacham Writing Workshop, which will take place next week. I’ll be reading at noon on the 27th (details are up in my Performances section), and I’ll also be taking part in a seminar. However, I have not received word on when that will be going down. It’ll be either Saturday or Sunday, but as soon as I find out, I’ll post the update. If you’re interested in coming though, make sure to keep your eyes on this site. Dun, dun, dunnnnn. In other news, I’ve been hearing back from people regarding my manuscript, and so far, everybody likes it! There have been a number of questions, which is TOTALLY fine and something that I love. I put this bad boy together with layers intended. I know it’s clichéd to say, but really, it’s constructed for the reader to come back to more than once. I promise that there are things that most people will miss on their first run through it, and if that’s the ONLY read, they’ll miss out on the full experience that I worked to create. Just sayin’. In any case, I’ve had a ball sending the work out to be considered for publication and prizes. We shall see how things shake out… about half a year from now! Mua ha ha!!! Your Friendly Neighborhood Xtian has STUFF to discuss. Stuff, yo! First, I’ve started sending my manuscript out to a few trusted people to read, and the response thus far has been AMAZING. That and VERY humbling. Also, just yesterday, I sent it out as my entry into a first book competition. After I submitted it, I thought, “Holy Jeevs! I wrote a BOOK!! !” I still feel that way. The act of letting it go kind of made it all real to me, and that was a bit of a surprise. So, fingers crossed and all of that. I’ll be hearing something in five or six months, so stay tuned! In other biz, I’m really looking forward to rocking out at Dalton State and for Meacham at the end of this month. You should come out if you’re free to do so. I’d love to see your faces, and, as always, I’m going to put in that work, work, work, work, work to make sure you have a solid poetry experience with yours truly. How about that? Lastly, I JUST uploaded a new video to YouTube. It’s from my feature at January’s edition of The Bar Exam. It was a good time, and I seldom get to do that poem anymore, so if you haven’t heard it, CHECK IT OUT!